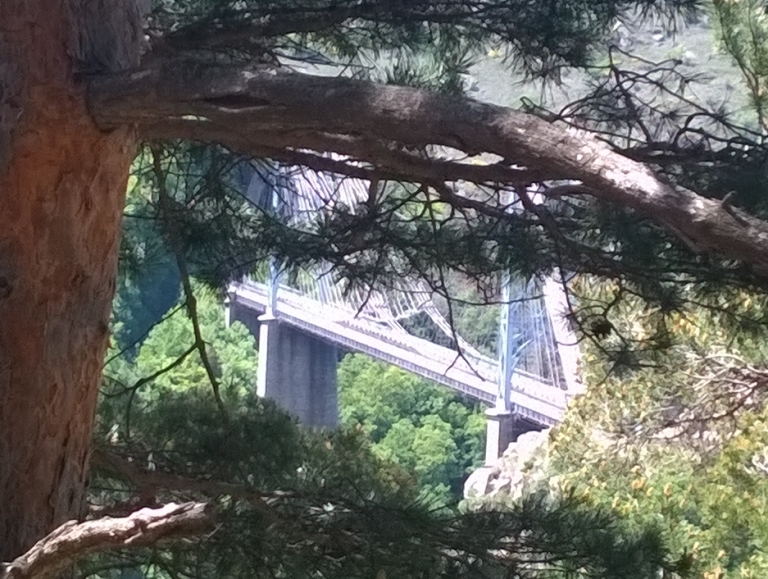 Attractive circuit of a dramatic bridge over a gorge in the eastern Pyrenees. Good forest, gorge and mountain views. 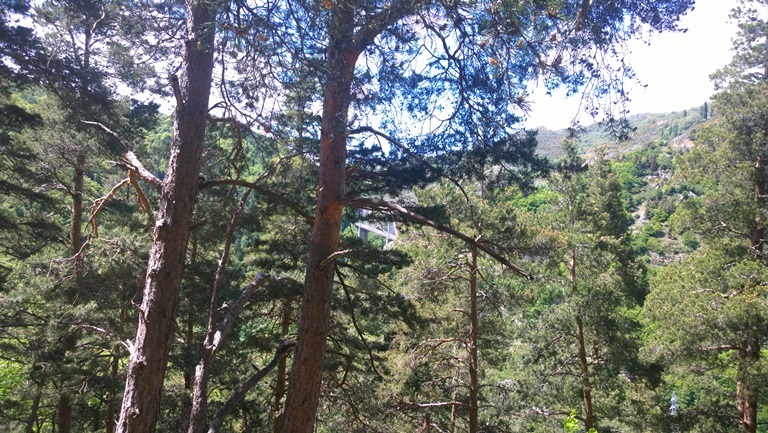 In the Parc National Régional des Pyrénées catalanes, south-west of Prades. Info provided by a Walkopedia member, sadly anonymously - THANK YOU! This particular walk uses a variety of waymarked paths (using the yellow and red line technique) called the PR 5 etc. There is even an option to use the little yellow train as a start and end point. The walk has additional signage: describing special trees, outlining the history of the little yellow train and the engineering feats. Easiness and Safety On some guides this is listed as "facile" however be ready for the occasional steep path or scramble. It is not a walk for sandals. 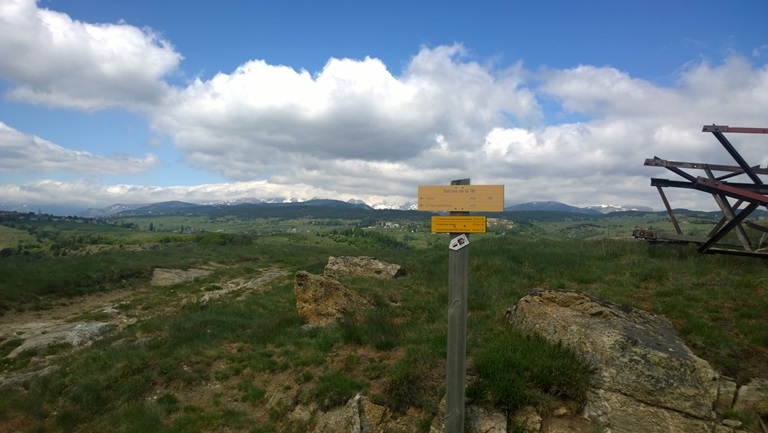 The start point is 1500 metres above sea level. Any weather condition may apply. Sometimes more than one in a day. Start Point There are two or three parking bays in Planés which is itself 6.8 KM south of Mont-Louis. The walk assumes you have parked in front of the Mairie (and toilets). Getting there From Vernet les Bains head towards Villefranche de Conflent and turn left on the N116 towards Mont Louis and Andorra. At the roundabout on the outskirts of Mont-Louis (with the service area and ski-hire shop Edelweiss on your left) turn left to Planés. Admire the views of the alpine style high plane as a contrast to the deep valley climb your car has just made. The Walk Start upwards towards the chapel which itself has interest. Then take a small service road towards the pylon visible on the hill. From there follow a path turning right towards St. Thomas les Bains. This descends through the forest. After about 30 mins you take a left branch away from St Thomas Les Bains just before the forest boundary. This branch is at a crossroads of many paths. Take the leftmost branch, possibly signed Planés. Beyond that you just keep going. There are two paths which take right branches but keep on the main direction. You will have glimpses of the train and a special suspension bridge (the Pont Gisclard) with an interesting history, oh and a hydro-electric station. Eventually you will pass very close to the suspension bridge (to the left of the West side) and walk beyond with Planés station on the right. Then you will encounter a cart track going left and uphill back to Planés. On the left of this road is an interesting rock formation with some climbing gear already inserted. Walk Duration 3 hours How much uphill 1 hour Facilities The toilets near the Mairie in Planés were clean and in good order. Font Romeu or St.Thomas Les Bains may be the best for a coffee stop." Have a look at TripAdvisor - there are tens of millions of reviews, so you may get good, current views on this walk and area.